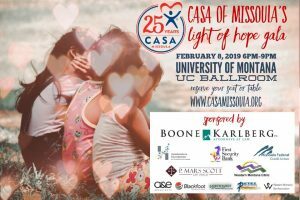 CASA of Missoula’s annual Light of Hope Gala is Friday, February 8, 2019 from 6pm-9pm at the University of Montana UC Ballroom. 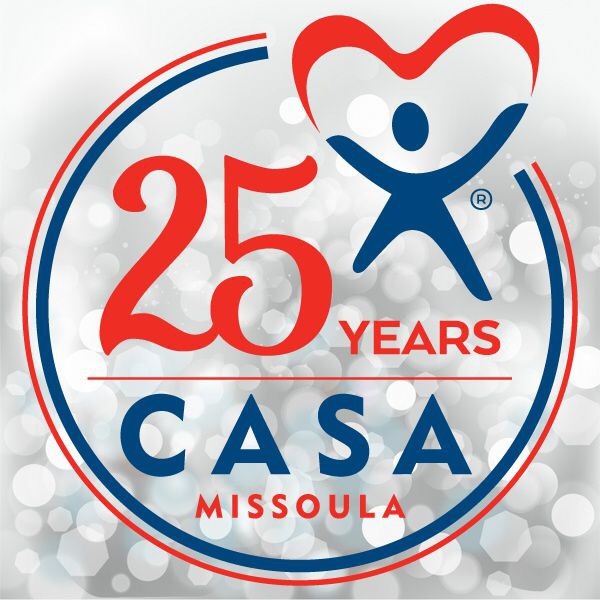 As CASA of Missoula’s signature fundraiser, this evening includes a silent and live auction, dinner and music. Presentation to include: Boone Karlberg Judge’s Award, CASA of the Year, Celebrating 25 Years of CASA, & more! Meet & greet some of CASA of Missoula’s amazing volunteers! for their Light of Hope level sponsorship. 25th Anniversary Honorary Judge’s Award. • Optional: 16 banquet tickets (2 tables) for the event if you would like to attend or send attendees. Two raffle tickets for each guest to participate in the wine or wagon raffle. • Optional: 16 banquet tickets (2 tables) for the event if you would like to attend or send attendees. One raffle ticket for each guest to participate in the wine or wagon raffle. • Optional: 8 banquet tickets (1 table) for the event if you would like to attend or send attendees.